Access to high speed Internet is enabling Small to Medium Enterprises (SMEs) opportunities previously reserved only for large enterprises. Global market reach and access to cloud services that previously required exorbitant on premises infrastructure are now possible for SMEs. According to a survey by the U.S. Small Business Administration (SBA), a third of SMEs are not content with Internet access speeds available to them. When the required speed is available, the cost of service is usually an issue. In this article, we discuss options for higher speed Internet access (100 Mbps+) in the USA and the factors affecting business Internet providers’ pricing. The cloud is increasingly becoming important for SMEs. Most SMEs are finding it more profitable to ditch on premise infrastructure and outsource most of their IT services from the cloud. Moreover, many SMEs engage in electronic commerce and seek to access markets beyond their borders. Consequently, cloud computing, along with video streaming, IoT and other bandwidth hungry applications are driving the demand for high bandwidth in all segments of communication networks – access, metropolitan, terrestrial long haul and submarine. In response to the demand for high speed transmission, vendor companies, institutions and standards organizations are relentless in their effort to develop communication technologies that meet the bandwidth demand. By 2010, 40G and 100G standards were ratified and by the end of 2017, 400GbE (Gigabit Ethernet) was approved. Network engineers continue to work on achieving even higher transmission speeds. These efforts immediately translate into very high performance in carrier networks in the metro, terrestrial long haul and undersea networks. In a previous article on Field Trials of Terrestrial 400G , we showed how operators were trialing or even deploying 400G systems long before the standards were approved. Unfortunately for many SMEs, a serious bottleneck exists between high speed transmission networks and the low capacity access networks to access the cloud through business Internet providers. Unlike large enterprises with deep enough pockets to develop or lease high capacity fiber to access carrier networks, most SMEs rely on the local loop or last mile infrastructure from local exchange carriers. In the USA the main wireline last mile infrastructure includes twisted pair copper, Hybrid Fiber Coaxial (HFC) or cable and optical fiber. Initially deployed for voice communications, twisted pair copper is the most widely deployed. The industry has been relentless in its effort to take advantage of the copper infrastructure to deliver broadband services. T1 lines and Digital Subscriber Lines, usually denoted as xDSL for the different versions of the service, are the most readily available services over copper. T1 lines typically deliver 1.5 Mbps of dedicated bandwidth while the latest version of xDSL, VDSL (Very High Bit Rate Digital Subscriber Line), typically delivers 100 Mbps over 500m of copper. The longer the distance from the subscriber to the central office, the lower the bandwidth delivered. A relatively new standard, G.fast, is capable of delivering higher bandwidth over copper. A number of business Internet providers are delivering up to 1 Gbps over using G.fast. To mitigate against the distance/bandwidth limitations, fiber has to be deployed deeper into the access network in a Fiber To The Cabinet (FTTC) configuration. In this configuration, fiber is terminated at an equipment cabinet close to the subscribers and short runs of copper connect the subscribers to the equipment in the cabinet. In an HFC deployment, optical fiber is installed to connect the head-end or distribution center of the cable network to nodes close to the subscriber. Co-axial cable is then used to connect the nodes to subscribers. A tremendous amount of effort has gone into squeezing as much bandwidth as possible from HFC networks. The standard for delivering broadband over cable is Data Over Cable Service Interface Specification (DOCSIS). The current version, DOCSIS 3.1, can deliver 10 Gbps although 300Gbps and 1 Gbps are more readily available. While the cost of cable or HFC broadband is relatively low, the mass market service may not always meet some business requirements as discussed in the next section. For example, while a service may be advertised as 1 Gbps (download speed), the upload speed is typically less than 30% of the advertised download speed. This is a hindrance in cloud connectivity applications where high volumes of data must be frequently transmitted to the cloud. Pure fiber to the premises is the ultimate in both high speed, symmetrical (equal upload and download) bandwidth and better Quality of Service (QoS). In this article, our fiber discussion focuses on Ethernet service. Ethernet over fiber is now delivering 1 to 10GbE with the possibility of upgrading to even higher data rates, but services are still limited to a few markets, especially large cities. Use our carrier research tool, GeoQuote or contact FiberGuide to find out which services are available at any address of interest. While some Internet providers are offering residential subscribers up 200 Mbps for as little as $50 (or less), the cost for business Internet access is significantly more. The pricing graph above does not only show higher rates for business Internet, but a large variability in pricing for any given service. In the sample provided, pricing range from $400 to $5,000 for 1Gbps access. There is a wide range of factors that drive the cost of higher speed business Internet access. It is incumbent upon the IT manger to understand completely these factors and how the different business Internet provider packages compare before settling for one that best meets the organization’s needs and budget. 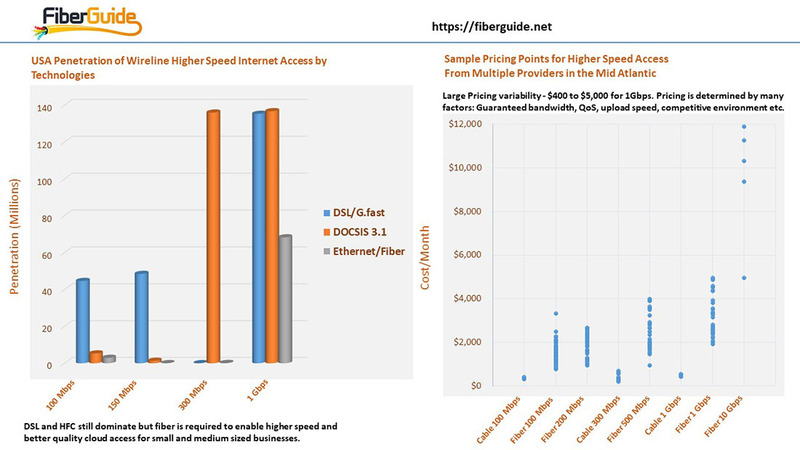 The cost of higher speed access varies by region, with lower prices where multiple providers offer similar services. There is still wide spread shortage of higher speed Internet access in smaller cities and rural areas and the cost is generally higher when available. Business Internet providers offer SLA for higher priced packages. A SLA guarantees that the services will be provided as promised. In the event that the service degrades, the subscriber may be able to renegotiate the terms and pricing of the service. Business SLAs typically include an MTTR (mean time to repair), a guarantee that someone will be there to fix the problem at an agreed upon time. Typical mass market broadband Internet access does not come with guaranteed bandwidth. It is usually offered as “best effort” and there is typically a clause in the contract to the effect that actual speed may be lower. Because mass market broadband services are usually shared, the actual bandwidth at any given time can fluctuate depending on the number of users on the network. If you are purchasing a dedicated Internet package from a business Internet provider, they must guarantee a minimum speed at any given time. Guaranteed bandwidth can be thought of as having a 1:1 contention ratio. Availability is defined in terms of uptime, a measure of the time the network is operational as opposed to downtime when the network is not functioning. Availability is measured as a percentage of the time the network is operational. Typical uptime guarantees offered by business Internet providers range from 99.9% to 99.999% (the so called 5 9s). While the difference might look trivial, these uptimes translate to 9 hours of downtime per year for 99.9% and only 5 minutes of downtime per year for the 99.999% uptime. For some applications such a difference is a big deal and can translate into a large difference in the cost of the service. Business Internet providers typically offer static IPs as opposed to dynamic IPs available to residential subscribers. Static IPs are more reliable, secure and are required if a subscriber needs to host their own website or email server. The choice of static vs dynamic IP can have a significant impact on the cost. Many businesses will opt for symmetrical services with equal download and upload speeds such as 1 Gbps/1 Gbps. Cable and DSL services may be offered as asymmetric services, such as 1 Gbps/25 Mbps. The choice of symmetric vs asymmetric service can also have a significant impact on the cost of the service. Latency is the time delay between the transmission of a data packet and when it is received. Applications such as VoIP, gamming and high frequency trading are sensitive to latency. In VoIP, high latency manifests itself as a noticeable delay between the time one talks into a handset and the time a response is received from the other end of the line. Delay in voice communications starts to be noticeable at 250ms latency. At more than 300ms, the delay can start to be irritating as both parties to a conversation start to talk over each other. Over 500ms, it becomes difficult to have a meaningful conversation. In high frequency trading, traders want a transaction to be effected immediately they execute an online order. A millisecond advantage in latency can translate into thousands of dollars in profit. Most high frequency traders opt to colocate with the stock exchange to keep latency to a bare minimum. Jitter is the change in latency and it has a more negative impact on the network than latency. Applications that are sensitive to latency are even more sensitive to jitter. In VoIP, for example, two parties to a conversation will eventually come to terms with latency and time themselves accordingly. When the network has jitter, it becomes difficult to guess when a response will be received. Some business Internet providers may specify jitter and low jitter may come at a premium. Business Internet providers may package their service with a number of options that can make a difference in the price. These include voice, video, cybersecurity, network monitoring, web hosting, email addresses, a wireless gateway and access to wireless hotspots by larger providers with national coverage. FiberGuide offers free network monitoring for any WAN service acquired through the company. In summary, higher speed Internet access is not scaling in unison with long distance transmission networks but 100 Mbps to 1 Gbps is readily available in most major cities. While copper (twisted pair and coaxial) based access is more readily available than fiber, it comes with some short comings that the IT manager should be well aware of. Many factors influence the cost of subscribing to higher speed business Internet access. It is incumbent upon IT managers to have a thorough understanding of these factors so as to make informed decisions when choosing from business Internet providers and packages. Through our online carrier research tool, GeoQuote, one can research services from business Internet providers and other WAN solution providers. For more complex services, a FiberGuide agent is available to offer free consultancy on options available from a multitude of providers. In addition to narrowing down your options and providing you with services that match your technical requirements and guaranteed best pricing, FiberGuide will also work with you through provisioning and beyond implementation. In other words, in addition to having a direct relationship with the carrier, a FiberGuide agent will remain as an ongoing resource to help you with any questions or issues you may have with your selected carrier, as well as provide you with support. FiberGuide specializes in business Internet access and other WAN services including T1 lines, Ethernet over copper, Ethernet over fiber, Ethernet Virtual Private Lines (EVPLs), SD-WAN, International VPLS and other carrier services. For complex solutions, such as multi-site connectivity, we also offer free pre-sales network engineering support.